April 30, 1971 Dwight Hal Johnson, Medal of Honor recipient, died. Johnson was born May 7, 1947 in Detroit, Michigan. 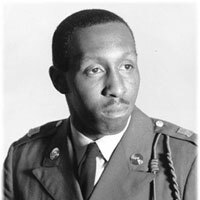 He was drafted into the United States Army in 1967 and in June, 1968 was serving in Company B, 1st Battalion, 69th Armor, 4th Infantry Division in the Republic of Vietnam. His citation partially reads: “Specialist Johnson’s tank, upon reaching the point of contact, threw a track and became immobilized. Realizing that he could do no more as a driver, he climbed out of the vehicle, armed only with a .45 caliber pistol. Despite intense hostile fire, Specialist Johnson killed several enemy soldiers before he had expended his ammunition. Returning to his tank through a heavy volume of antitank rocket, small arms and automatic weapons fire, he obtained a sub-machine gun with which to continue his fight against the advancing enemy. Armed with this weapon, Specialist Johnson again braved deadly enemy fire to return to the center of the ambush site where he courageously eliminated more of the determined foe.